Watch the video given below to get a better idea on how LED works? Â A light emitting diode (LED) is known to be one of the best optoelectronic devices out of the lot. The device is capable of emitting a fairly narrow bandwidth of visible or invisible light when its internal diode junction attains a forward electric current or voltage. The visible lights that an LED emits are usually orange, red, yellow, or green. The invisible light includes the infrared light. The biggest advantage of this device is its high power to light conversion efficiency. That is, the efficiency is almost 50 times greater than a simple tungsten lamp. The response time of the LED is also known to be very fast in the range of 0.1 microseconds when compared with 100 milliseconds for a tungsten lamp. Due to these advantages, the device wide applications as visual indicators and as dancing light displays. We know that a P-N junction can connect the absorbed light energy into its proportional electric current. The same process is reversed here. That is, the P-N junction emits light when energy is applied on it. This phenomenon is generally called electroluminance, which can be defined as the emission of light from a semi-conductor under the influence of an electric field. The charge carriers recombine in a forward P-N junction as the electrons cross from the N-region and recombine with the holes existing in the P-region. Free electrons are in the conduction band of energy levels, while holes are in the valence energy band. Thus the energy level of the holes will be lesser than the energy levels of the electrons. Some part of the energy must be dissipated inÂ order to recombine the electrons andÂ the holes. This energy is emitted in the form of heat and light. The electrons dissipate energy in the form of heat for silicon and germanium diodes. But in Galium- Arsenide-phosphorous (GaAsP) and Galium-phosphorous (GaP) semiconductors, the electrons dissipate energy by emitting photons. If the semiconductor is translucent, the junction becomes the source of light as it is emitted, thus becoming a light emitting diode (LED). But when the junction is reverse biased no light will be produced by the LED, and, on the contrary the device may also get damaged. 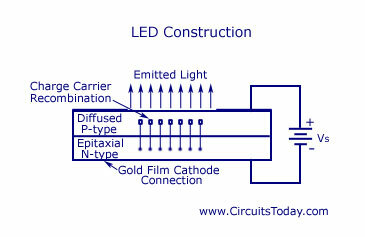 The constructional diagram of a LED is shown below. All the semiconductors listed above can be used. An N-type epitaxial layer is grown upon a substrate, and the P-region is produced by diffusion. The P-region that includes the recombination of charge carriers is shown is the top. Thus the P-region becomes the device surface. Inorder to allow more surface area for the light to be emitted the metal anode connections are made at the outer edges of the P-layer. For the light t be reflected as much as possible towards the surface of the device, a gold film s applied to the surface bottom. This setting also enables to provide a cathode connection. The reabsorption problem is fixed by including domed lenses for the device. All the wires in the electronic circuits of the device is protected by encasing the device. The light emitted by the device depends on the type of semiconductor material used. Infrared light is produced by using Gallium Arsenide (GaAs) as semiconductor. Red or yellow light is produced by using Gallium-Arsenide-Phosphorus (GaAsP) as semiconductor. Red or green light is produced by using Gallium-Phosphorus (GaP) as semiconductor. The circuit symbol of LED consists of two arrow marks which indicate the radiation emitted by the diode. 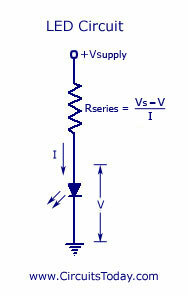 The forward bias Voltage-Current (V-I) curve and the output characteristics curve is shown in the figure above. The V-I curve is practically applicable in burglar alarms. Forward bias of approximately 1 volt is needed to give significant forward current. 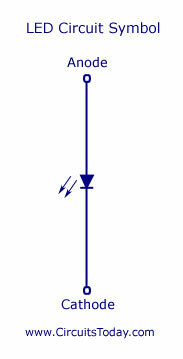 The second figure is used to represent a radiant power-forward current curve. The output power produced is very small and thus the efficiency in electrical-to-radiant energy conversion is very less. The figure below shows a series resistor Rseries connected to the LED. Once the forward bias of the device exceeds, the current will increase at a greater rate in accordance to a small increase in voltage. This shows that the forward resistance of the device is very low. This shows the importance of using an external series current limiting resistor. Series resistance is determined by the following equation. The commercially used LEDâ€™s have a typical voltage drop between 1.5 Volt to 2.5 Volt or current between 10 to 50 milliamperes. The exact voltage drop depends on the LED current, colour, tolerance, and so on. 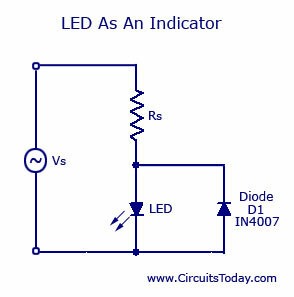 The circuit shown below is one of the main applications of LED. The circuit is designed by wiring it in inverse parallel with a normal diode, to prevent the device from being reverse biased. The value of the series resistance should be half, relative to that o f a DC circuit. LEDS displays are made to display numbers from segments. One such design is the seven-segment display as shown below. Any desired numerals from 0-9 can be displayed by passing current through the correct segments. To connect such segment a common anode or common cathode cathode configuration can be used. Both the connections are shown below. The LEDâ€™s are switched ON and OFF by using transistors. Very low voltage and current are enough to drive the LED. Voltage range â€“ 1 to 2 volts. Current â€“ 5 to 20 milliamperes. Total power output will be less than 150 milliwatts. The response time is very less â€“ only about 10 nanoseconds. The device does not need any heating and warm up time. Miniature in size and hence light weight. Have a rugged construction and hence can withstand shock and vibrations. An LED has a life span of more than 20 years. A slight excess in voltage or current can damage the device. The device is known to have a much wider bandwidth compared to the laser. The temperature depends on the radiant output power and wavelength. http://911electronic.com/ It is site about electronics parts, symbols, characteristics and all basics. How to prepare emergency LED light for 18×20 ft size room.